DEAR PAM: Fixing foundation cracks is an enormous business. There are many different and specialized solutions for the different types of foundation cracks and problems. Unfortunately, there is no one-size-fits-all solution with respect to this subject. Choosing a repair method that will almost always work often requires the advice of an independent third party. Instead of making three phone calls to contractors, I would have first called a structural engineer that specializes in residential problems. A seasoned engineer's advice is necessary for several reasons. The actual cause of the foundation failure needs to be identified correctly so that the proper solution is employed. A salesperson from a repair company may just want to sell his product or service even though it may not be the best repair method. Perhaps more importantly, structural repairs that are not engineered properly can actually create stress points on the foundation. These new stress points can sometimes cause secondary structural problems within the foundation at a later date. Introducing an engineer into the mix creates an additional advantage. Typically, they will develop a one or two page report that contains a drawing or plan. The contractor that is eventually hired must follow this plan to insure that the foundation is repaired properly. In many states, engineers must pass a rigid professional certification test. This testing process helps to insure that the advice they offer is accurate and will work. You do not always get this same assurance from a repair company salesperson or contractor. Be sure to ask the structural engineer about soil problems. The fact that your crack just happened after 28 years of stability is very suspicious. Many parts of the nation experience moderate to severe droughts from time to time. The loss of water from the soil can cause it to shrink in volume. If the soil shrinkage does not happen at the same rate under the entire foundation, one corner or section may fall farther or quicker than other parts. This creates tension within the foundation. The tension force typically expresses itself as the actual crack. Water can be added in any number of ways. I have found that a powered fence post auger is a wonderful tool that allows you to drill a six-inch diameter hole 4 or 5 feet into the ground. Space these holes about six feet apart around your foundation. The hole can be filled with rounded gravel too within one inch of the surface. Regular rainwater or water provided by a sprinkler or soaker hose finds the gravel quickly. This water flows readily through the gravel and drops deep into the soil that lies near the bottom of the foundation. Once the soil soaks up the water, it often swells back up. To stop this back and forth motion of the soil, try to keep it slightly moist all of the time. By doing this, you can keep the foundation in a constant state of dynamic equilibrium. If the engineer is in agreement that your soil may be one that does shrink and swell in response to moisture changes, you may want to pursue this water injection method for several months before you begin to employ any other fix to the foundation. Many foundation problems can be avoided with the addition of extra steel to the concrete footers and actual foundation. The building code requirements for structural steel are minimum requirements. You can increase the size of steel and the number of pieces of steel for very little extra cost in most cases. Once again, a small consulting fee paid to a residential structural engineer during the planning phase can pay huge dividends down the road. Imagine spending less than a thousand dollars up front for a simple consult and extra steel instead of paying many thousands of dollars to repair a weak foundation at a later date. We bought a new construction house in March 2012. 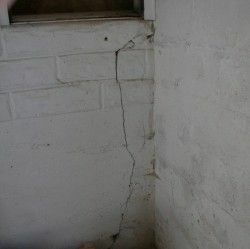 Recently we have noticed that there are several cracks in the stem wall and the foundation in the garage. The house is not even a year old, and my question is should this be happening this soon? We live in central Oklahoma (approx. 60 miles from the earthquake epicenter). What could be some reasons for the cracks so soon? I live in the southern part of Lousiana south west of New Orleans. I bought my first home May 2012, the house is 62 years old. I have a crack in the concrete foundation of the middle bedroom it was discovered after pulling up the carpet. The crack is at least an inch wide and six feet long. I did call an engineer to come out and look at it. He wants 18,000-20,000 to lift the foundation. Is there anything else I can do? I need help. Did you read all of my Concrete Crack columns? The ones about epoxy repair products? Nadia, Walter, this is what my 500-Second Consult is all about. Click the Shop icon at the top of the page! My wife and I built a new home 3 1/2 years ago. We are currently on our 3rd sump pump and installed the basement watchdog. We now have cracks in our basement walls and also have cracks in our entry way ceiling and living room ceiling. When it rains, water enters through several of the cracks. I took video of water pouring in the crack of the wall and running down the wall onto the floor. I called my insurance company today to start that process and see if I can get any help that way. My question to you, is my builder liable for any of this? Being that the house is still very new and only 3 1/2 years old, I have to question the way the house was built. Should I be contacting my builder? I can't imagine having to pay $10K - $20K to fix a foundation that is only 3 1/2 years old after paying the price for my house. What are your thoughts? My thoughts are this is too much to answer in one sentence. You need a Phone Consult. My home is 8 years old, i recently noticed with the constant rain that my home is shifting. I can see the foundation concrete as it is no longer covered by the soil. There are also numerous cracks two long cracks in my ceiling. I need some direction. We had our foundation lifted 3-1/2 years ago, and are still seeing new cracks appear in the drywall. Nearly every wall of every room has at least one crack. The foundation repair was expensive, but it will cost just as much to repair all the wall and ceiling damage. I'm considering having a 2nd (and 3rd?) company come out to do the leveling-test, just to see if the first company did more damage than good. Yes, we received a life-time transferable warranty, but I don't want to go back to the original company to ask them to come back and determine if they did a good job... Suggestions? Yeah, I suggest a phone consult with me because there's lots to talk about before you invest more time and energy in this situation. Hi, my Wife and I are building our first home, a two story with a walkout.We drove to the site tonight to see how the house is taking shape. The have poured footings, set block foundation, backfilled and started to frame the basement. While looking around we noticed a crack in the foundation from the very top course of block all the way to the footing. It's cracked through the center of blocks and also through mortar joints. How is something like this addressed? Does the wall need to be re-blocked or are there repairs for these situations? I would like to get opinions before I hear what they have to say. The builder hasn't said anything about it, but I think it has just happened yesterday or today. I have pictures and have contacted our Rep to see what they say. It's addressed by having a residential STRUCTURAL engineer come out IMMEDIATELY to the site. GET PHOTOS of this NOW before it's repaired. the walls and gouges where they will show on the outside. We are having a engineer come look at the damage. If they just fix it without re-pouring are we out of line to ask for any compensation, guarantees or warranties? Our home was built on a steep slope at the top of a hill. Dirt was hauled in and many trees cut down. We are coming on to a year and noticed cracks in our driveway, and Garage. A large hole was found the first month just off the side walk 4 fr from the house where water was draining from under the house, the builder filled some large holes with concrete but it we know that’s a temporary fix, the water needs to drain somewhere. Inside cracks run up the walls and door frames are not flush. Our new in ground pool has sunk on one side about 4-6 inches and the guy who installed it doesn’t know what to do. We are asking the builder for retaining walls in the front yard since there’s many holes due to water running under the sod. Any suggestions and do you think a retaining wall or two would help?